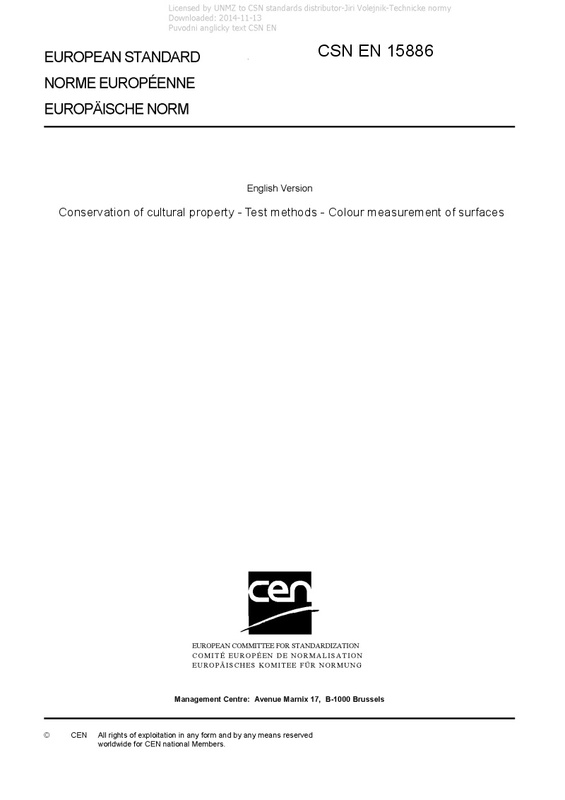 EN 15886 Conservation of cultural property - Test methods - Colour measurement of surfaces - This European Standard describes a test method to measure the surface colour of porous inorganic materials, and their possible chromatic changes. No reference to the appearance of glossy surfaces is described. The method may be applied to porous inorganic materials either untreated or subjected to any treatment or ageing. The method is suitable for the measurement of colour coordinates of: - representative surfaces of specimens, see 3.11; - representative surfaces of objects, indoors or outdoors.